Rack of lamb is the filet mignon of the lamb. 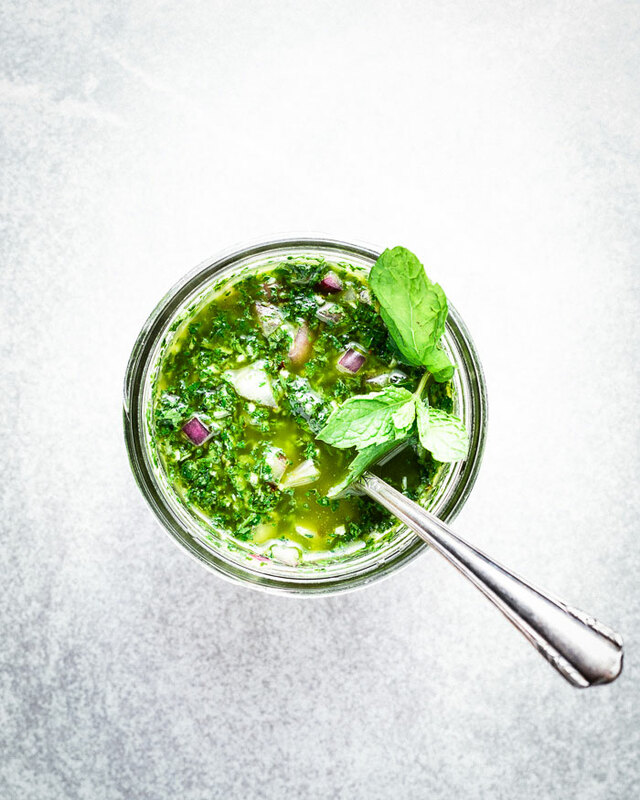 It is luxurious and is so wonderful when grilled and paired with this mint chimichurri sauce. Rack of lamb is the “filet mignon” of the lamb. It is so good that it really doesn’t need much of anything and it cooks really quickly on the grill. While it seems really fancy, it’s really a great protein for a summer party because they cut into perfect little lamb lollipops. A simple sauce to complement and a fresh salad is just perfect. I definitely don’t like to give it a big marinade that will take away from the amazing lamb flavor, and it doesn’t need any tenderization. 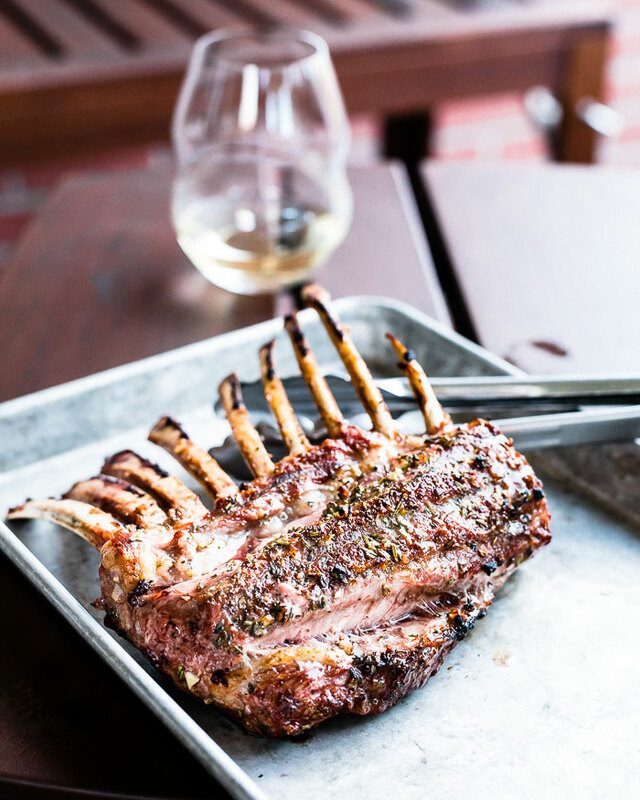 There’s a reason rack of lamb is so expensive in fancy restaurants. A lot that goes into butchering it if you want it to look a certain way. Since I don’t run a Michelin-starred restaurant out of my house, I don’t spend a whole lot of time “frenching” the lamb rack completely. I do like trim a lot of the excess fat and remove most of the sinew off the loin. Use a very sharp knife and take as little of the meat as possible when cleaning it. It takes a lot of practice, patience and some more practice to get really good at it. Feel free to butcher/clean the rack as much or as little as you like. 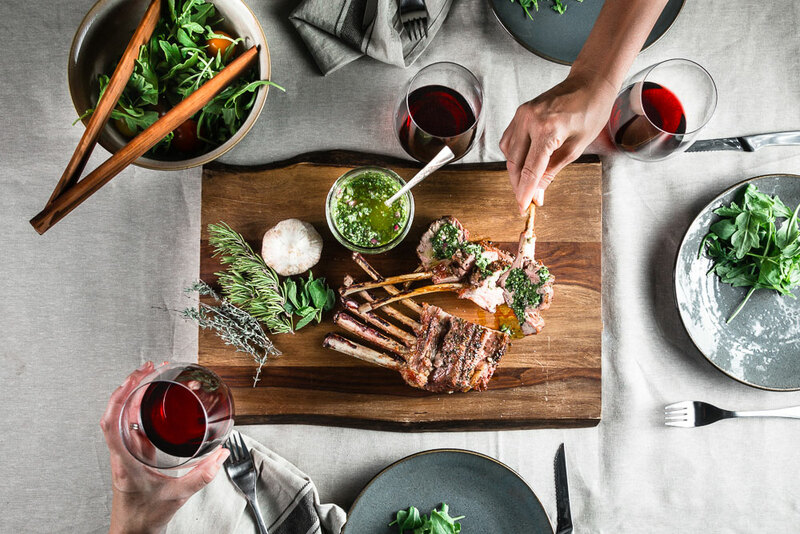 It will taste great no matter what, especially when you use True Aussie Lamb. Seriously, their rack of lamb is so amazingly tender and flavorful. Have you ever heard about or used a Big Green Egg? Ok, well this grill is beyond amazing. I’m really excited to be partnering with True Aussie Beef & Lamb and Big Green Egg for this recipe. 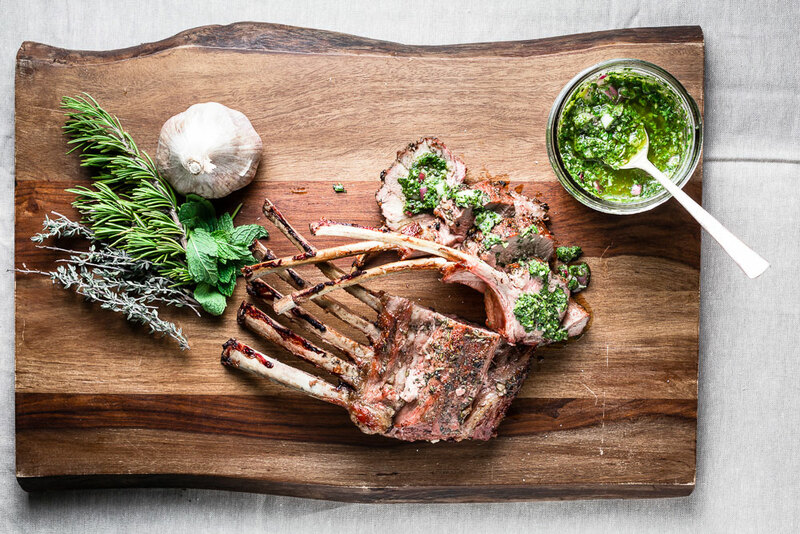 I love fresh green sauces for summer grilling, and nothing is more classic than pairing lamb and mint. 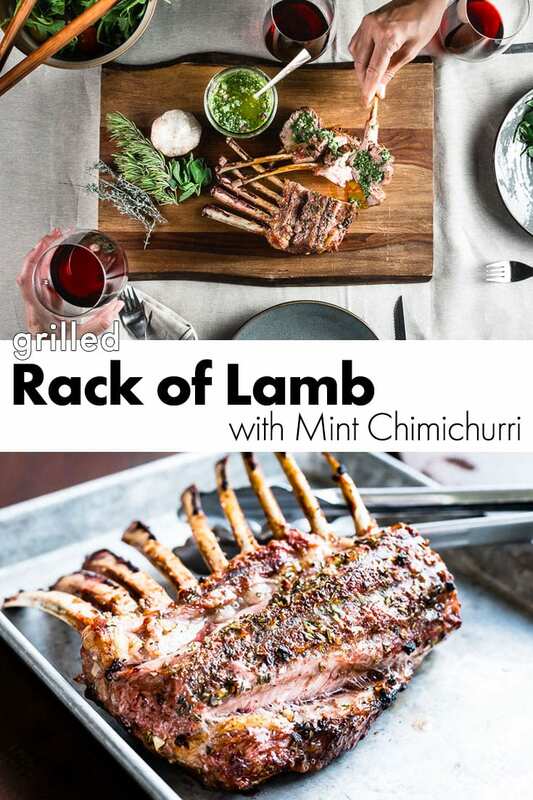 This grilled rack of lamb recipe is paired with a vibrant mint chimichurri that can be used on so much more than just the lamb. It is delicious. 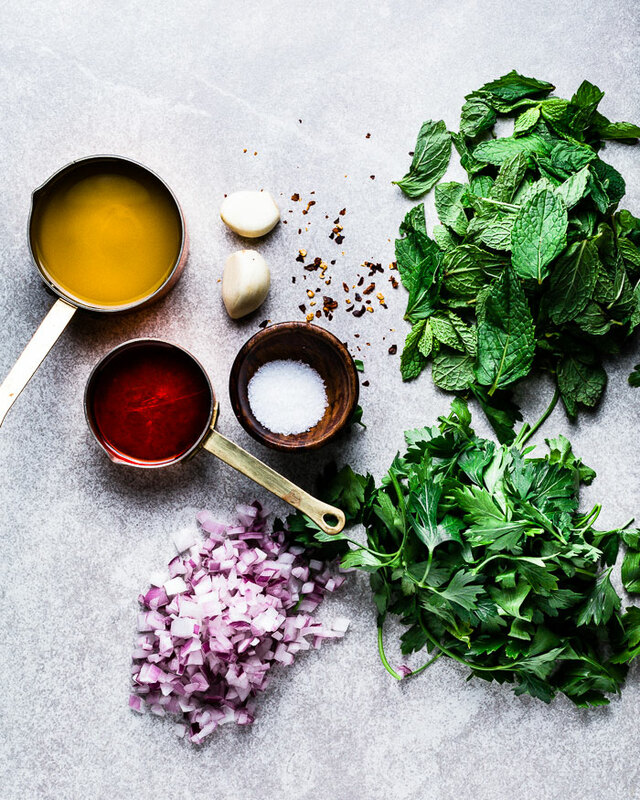 Just a few simple ingredients for this fresh-tasting sauce. Mint, parsley, olive oil, red wine vinegar, garlic, red pepper flakes, kosher salt and diced red onion. Process all of the ingredients except for the red onion in a food processor or a blender. 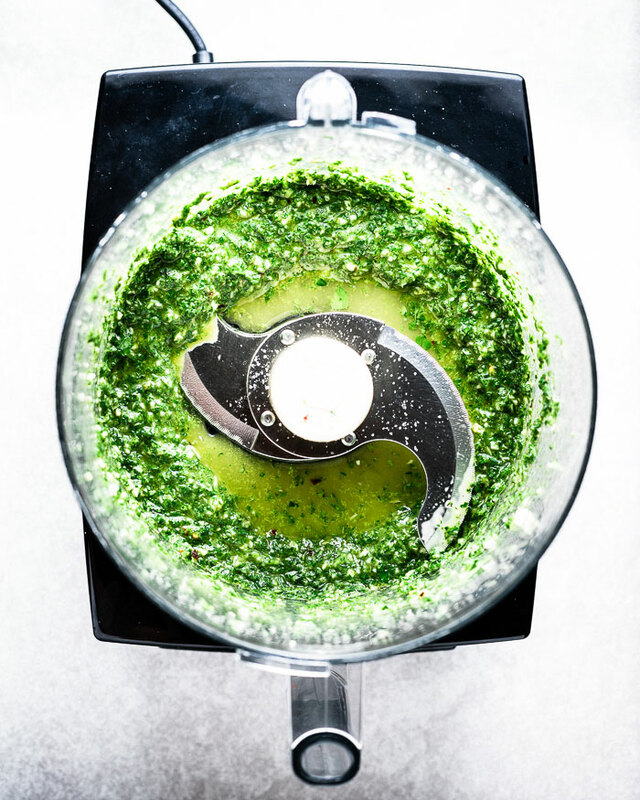 Don’t over blend or keep it running for too long at a time, or the blade can heat up and cause the herbs to turn dark. Move it to a bowl or a jar and mix in the red onion, which gives a wonderful purple contrast color with the green. 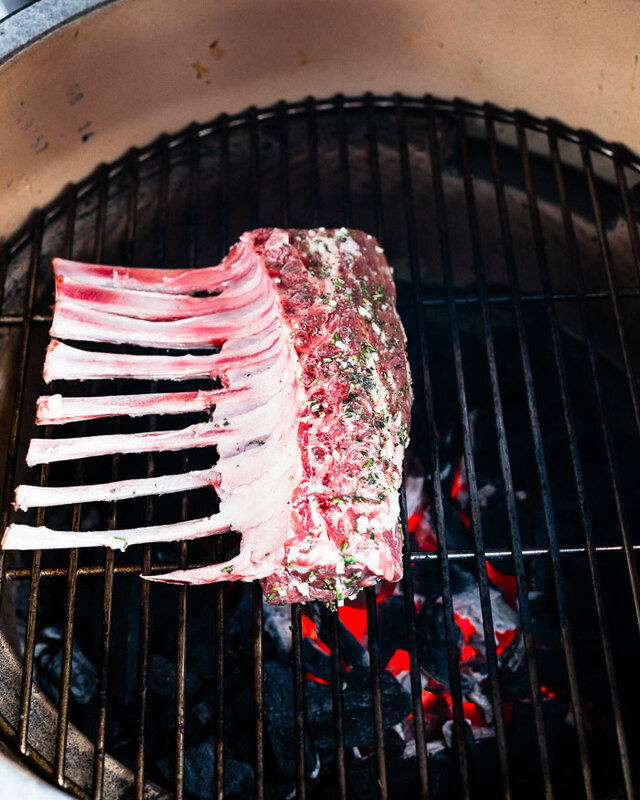 When grilling rack of lamb, the key is to get a really nice crust on the outside and a perfectly cooked inside. To do this, you want a hot grill, but not a big flame. You want to render the fat, while being very careful not to overcook the meat or char the fat too much. Flare-ups will happen since there is a good amount of fat on the racks. Keep the lid closed as much as possible to prevent this from happening. If it’s a big issue, you can keep a spray bottle of water to help, but I would try to avoid that if you can. Another thing that can happen is the rib bones can char, which isn’t as pretty for your presentation. If the racks took a long time to cook, you could cover the rib bones with foil to prevent them from burning. 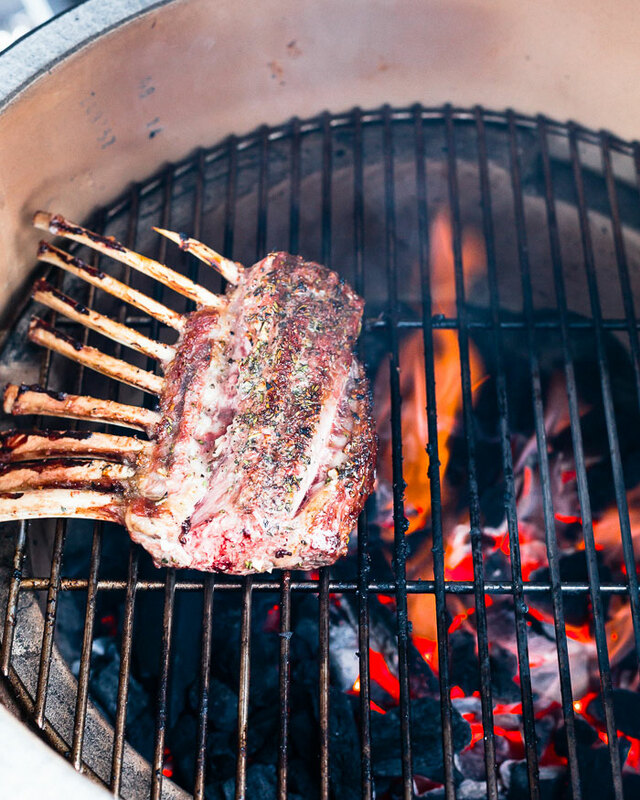 Since rack of lamb cooks so quickly, it’s best to just leave the rib side away from the fire towards the outside of your grill. 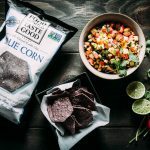 The garlic and herb rub will char a little bit, but this really adds to the flavor and goes great with the fresh tasting chimichurri sauce. 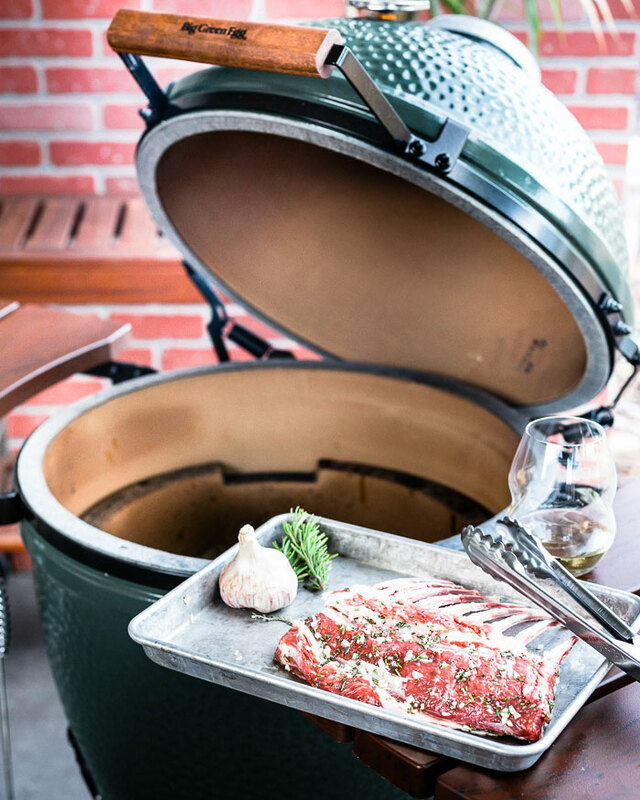 The big green egg excels in slow cooking over a long period of time (like all day). A few weekends ago, I made a smoked lamb shoulder that I smoked for 5 hours. I didn’t have to add more charcoal for the entire time and the temperature stayed constant. If you have ever tried to smoke meat over a long period of time, you know this is pretty amazing. 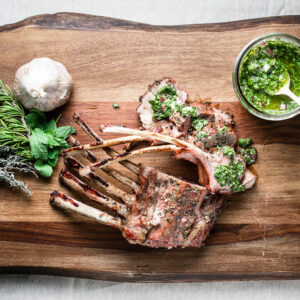 This True Aussie Rack of Lamb is melt in your mouth tender and has such a wonderful flavor. Find where you can find it near you. 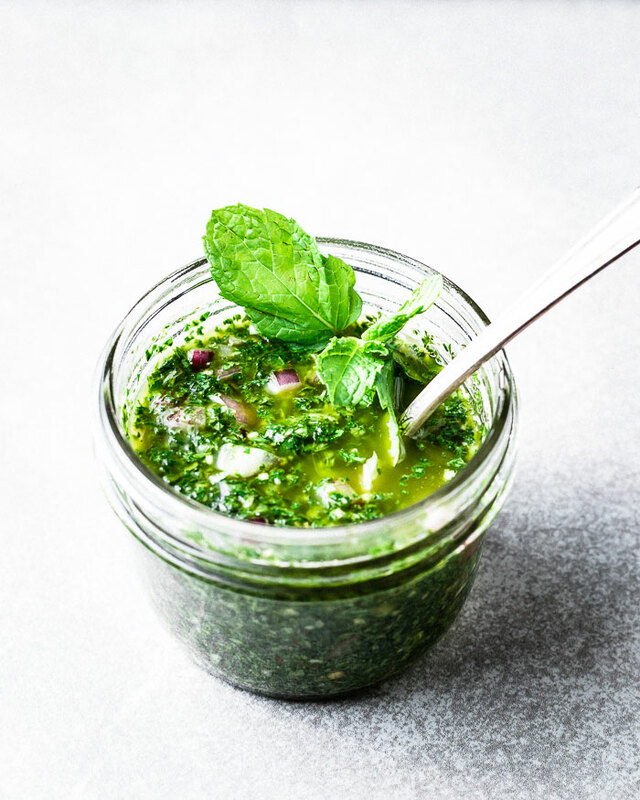 Serve it up the mint chimichurri and with your favorite salad or summer veggies and enjoy with friends. This post is in partnership with True Aussie Beef & Lamb and The Big Green Egg. All opinions and thoughts are always my own. Combine the garlic, thyme, rosemary, and canola oil in a small bowl. Rub mixture over the lamb and let it come to room temperature. Pre-heat your grill until hot for about 5 minutes if using a charcoal grill, or about 15 minutes on medium-high if using gas. Season the lamb heavily with kosher salt and freshly ground pepper. Clean and oil the grill grates. Sear the lamb bone side down first and rib bones facing away from the flames so they don't char, over a medium part of the grill for about 5 minutes per side with the lid closed. Be very careful of flare-ups. Once you have nice grill marks, move the rack indirect heat to finish cooking until the internal temperature reaches 120 to 125 degrees for medium-rare, or 130 to 135 degrees for medium. Rest the lamb for 10 to 15 minutes on a cutting board tented with aluminum foil, then slice between the rib bones. Serve with the mint chimichurri and salad or your favorite veggie. Sprinkle some coarse salt on each piece of lamb before serving. Add the mint, parsley, garlic, olive oil, red wine vinegar, red pepper flakes and salt to a blender or food processor. Pulse until the ingredients are well chopped, but not puréed. Be careful not to blend for too long as the blades can heat up and cause the mint to turn black. Use a spatula to scrape down the sides to get an even chop. Transfer the sauce to a small bowl and stir in the diced red onion. Taste for seasoning and add more salt, red wine vinegar and pepper flakes as needed. Cover with plastic against the top of the chimichurri and store in the refrigerator before using. Rack of Lamb is best eaten when it is cooked medium-rare and not over cooked. 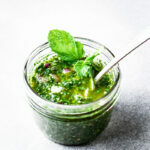 Chimichurri recipe yields about 1 cup of sauce and will be more than enough for multiple racks of lamb. A bright and fresh herb sauce that pairs wonderfully with meat roasts, steaks and grilled rack of lamb. 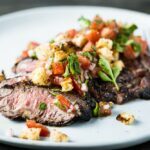 Quick-marinated flank steak with shallot, thyme, rosemary, parsley and olive oil, then it is perfectly grilled and topped with a breadcrumb salsa. Wow, that is beautiful. My husband never had lamb in his life before he met me, true story! The rules of the contest say “Limit one (1) entry into the Sweepstakes per person, per Participating Blog.” I can’t tell (grammar folks!) if that means one entry at all, or if I am supposed to go to each blog and enter. Let me know. I covet a Green Egg with green-eyed covetousness. That’s a good question. Let me ask and get back to you. Thanks! I heard back about your question and they told me that the rule limits each person to one entry. I hope this clarifies it for you. Thanks! Thanks Justin for taking the time to find out. Fingers crossed! My husband now loves a rack of lamb. Have you ever made those Moroccan Lamb meatballs? What do they put in them I wonder? they are fantastic. I’ve never tried smoking meat before. I keep seeing this big green egg though. Think I’ll enter the sweepstakes. I like lamb a lot but have only worked with ground and chops. A full rack kinda intimidates me. LOL. Am hoping to learn more about working with various cuts during the lamb session at IFBC this fall. In the meantime, definitely giving the sauce a try! Beautifully photographed, BTW. Hey Ani! If you like smoked meat (like I do), it’s so much fun. The smells are wonderful and then you get to enjoy at the end of the day. Not everything takes long to smoke, and the Big Green Egg is a joy to use. Thanks for reminding me about IFBC. I need to buy my ticket. Cheers! Thanks Justin, it worked out great, though we ate the whole rack with the two of us and that wasn’t the plan! I followed your recipe (nearly) to the letter and the result was wonderful. The rub and grilling is straight forward, even without a green egg (yes I registered). The mint sauce is very good, certainly a keeper, but I have enough left-over to try it on something else. Suggestions? Hi Adriaan, so glad it came out wonderful. Was it a trial run for your dinner party? I feel like you could use the sauce on so many things. Tacos, sandwiches, on chicken, steak, eggs, burgers, etc. Does that help? Made the mint chimichurri with lamb chops. It was delicious and easy to make! Thanks for the recipe!